On May 19, 2017, the Office of Vital Records (OVR) welcomed advanced practice registered nurses and physician assistants to the Minnesota vital records community. When Governor Dayton signed the bill into law, Section 16 of Chapter 59 (SF 1844), he increased the number of medical professionals who have the authority to certify death records in Minnesota where there are around 42,000 deaths per year. Now, more than 3,600 licensed physician assistants and 7,500 advanced practice registered nurses can provide information about the cause and manner of death that is part of a legal death certificate. Before the new law, only physicians (including medical examiners and coroners) could certify death records in Minnesota. Physicians in residency programs may provide cause of death only if licensed by the Minnesota Board of Medical Practice. OVR is making small technical tweaks to MR&C and is revising its communications so that medical certifier titles, credentials, and license numbers are up-to-date. OVR is adding instructions and updating documents so that medical certifiers have the information they need when they have to certify a death. Only medical certifiers have the authority to provide information about the cause of death including the manner of death and factors that contributed to the death. The medical certifier is responsible for the accuracy of the information and their name prints on the decedent’s death certificate. Medical certifiers (or staff they have designated) enter the cause of death in MR&C for more than 95% of deaths, eliminating old paper processes. MR&C emails notices to medical certifiers when records are pending cause of death and notifies funeral establishments, medical examiners and coroners when the death record is late, complete, referred to medical examiners or coroners, or when cremation is authorized. Using MR&C results in more timely, complete, and accurate death certificates for families. Although many medical certifiers enter data directly into MR&C, more than half have designated staff to enter the cause of death on their behalf. Having designated staff helps medical certifiers attend to records, provide backup when someone is out of the office, and use MR&C to maximum efficiency. In MR&C, funeral staff select the appropriate professional from a medical certifier table while creating the death record electronically. When medical certifiers become users of MR&C, email notifications go to the email address provided on the user agreement. 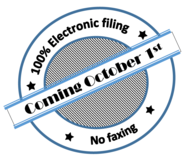 Be ready to certify death records in MR&C. OVR encourages medical certifiers, including advanced practice registered nurses and physician assistants and physicians who haven’t yet obtained an MR&C user account, to sign up now. See the Minnesota Department of Health website for the Medical Certifier / Designated Staff User Agreement and Death Registration Information for Medical Certifiers and Designated Staff Assistants. Contact the OVR Help Desk for more information at 651-201-5993 or health.MRCAdmin@state.mn.us. Until now, every agency, board, and commission in state government had their own logo (or no logo). The lack of a cohesive brand can be confusing. We want our customers to know when they are interacting with state government. State agencies work together to make life better for all Minnesotans, and a unified brand helps covey that message. The Minnesota Department of Health (MDH) transitioned to the new brand on June 1, 2017. Check out the MDH Certificates and Records page; quickly link to information for medical certifiers, funeral staff, birth registrars and county vital records office staff under the Professionals subheading. Vital Records News has changed to the new brand too! Now that you can read Vital Records News on your phone, look for tips, upcoming events and contact information at the end of the newsletter. Watch the MDH/OVR webpages for the new brand on Office of Vital Records (OVR) forms over the next months. OVR will notify user groups as updated forms are made available. In the short term, you will know that you have the most current form if it has the new look. Overdose deaths from opioids, including prescription opioids and heroin, have more than quadrupled since 1999. Opioids are a class of drugs used to treat moderate to severe pain. Prescription opioids include hydrocodone, oxycodone, morphine, methadone, and fentanyl. Heroin is an illegal opioid. All have serious risks and side effects. Among 52,404 drug overdose deaths that occurred in 2015 in the United States, 33,091 (63.1%) involved an opioid. 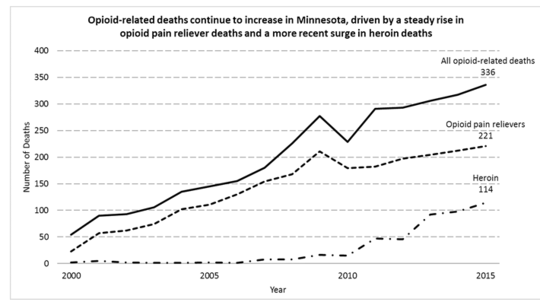 Drug overdose deaths among Minnesota residents reveal an alarming trend, jumping 11 percent from 2014 to 2015 according to MDH’s Injury and Violence Prevention Unit’s report, Drug overdose deaths among Minnesota residents 2000-2015. Minnesota had 572 people die from drug overdoses in 2015. Of those, 221 deaths were associated with prescription opiate pain relievers and 114 were deaths associated with heroin. Misuse of prescription opioids intertwines with that of illicit opioids. The percentage of drug overdose deaths involving heroin was triple the percentage in 2010. And, that may be the tip of the iceberg. In approximately 1 in 5 drug overdose deaths, the death certificate lists no specific drug. In many deaths, multiple drugs are present, and it is difficult to identify which drug or drugs caused the death (for example, heroin or a prescription opioid, when both are present). Read more at CDC Opioid Data Analysis. National Vital Statistics System (NVSS) Vital Statistics Rapid Release shows the Quarterly Provisional Estimates for drug overdose death rates continues in an upward trend in 2016. The crude death rate for drug overdose for the 12-month period ending with 2016 quarter two was 17.5, higher than the crude death rate of 15.5 in 2015 quarter two. The ongoing epidemic of opioid deaths requires attention and action. State and local public health agencies, medical examiners and coroners, law enforcement and others working together, use data to help track trends, identify communities at risk, and evaluate prevention strategies. Reporting drug-poisoning deaths that mention the type of drug(s) involved on the death record is one way, one record at a time, we join the fight to end the opioid overdose epidemic. Read more at The opioid epidemic may be even deadlier than we think . A recent report highlights the ongoing problem of over reporting on the pregnancy checkbox item on death certificates. Read more... Trends in Maternal Mortality by Sociodemographic Characteristics and Cause of Death in 27 States and the District of Columbia. The Office of Vital Records congratulates Terri Quanrud, Birth Registrar at Riverview Health in Crookston, Minnesota. Terri is the randomly chosen winner of the May 2017 “I read Vital Records News” drawing. Thanks to all who participated. Over 7,400 people receive Vital Records News each month. Encourage your colleagues to read the newsletter for the latest vital records program information and upcoming events. Thank you for your continued readership. June 13 - 16, 2017, Minnesota County Recorders Association (MCRA) Summer Conference, Deerwood, Minnesota. OVR presenting and exhibiting. June 21-21, 2017, Stillbirth Summit 2017, Bloomington, Minnesota. OVR exhibiting. June 29, 2017, CentraCare Birth Registrar Training, Sauk Center, Minnesota. July 11, 2017, Birth Registration 101, St. Paul, Minnesota.